Getting the Word Out About this Important Event! 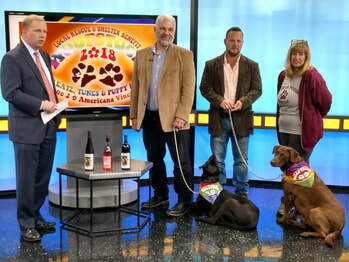 We work super hard to get the message out about Woofstock all OVER the Finger Lakes -- from Rochester to Syracuse, Elmira to Binghamton -- and beyond, because we believe in the work these rescues, shelters and programs do. And want everyone to come and have a fun day with us, while we help them all out! Here's a sampling of our 2018 and 2017 press with an ENORMOUS thanks to our media friends who helped us out! Laura has been a huge supporter of this event since year one, and has always had us and the dogs on -- way back when it was Max & Rubie. We can't thank her enough for her support over the years, and helping us get the word out to our Syracuse area friends! The Ithaca Voice is an online paper covering the Ithaca area, and was kind enough to give our event coverage! We appreciate the shout out, especially with all the details of everything going on that day! 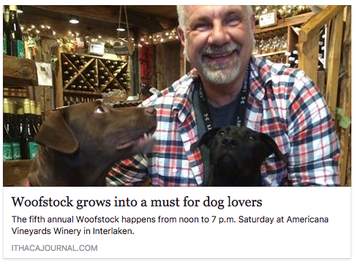 David Wren writes a great piece about the history of Woofstock and what it's grown into! And why this event is so important to all of us at Americana! We have always put Woofstock on their calendar, but this year, Life in the Finger Lakes picked up our presser and gave us an article on their website which we were so pleased to discover, because they have such a great reach to people traveling into the Finger Lakes looking for fun things to do! The gang was on Thursday morning, June 1 at 6:15 with Leanne DeRosa and her team -- helping us get out the word to the Southern Tier, and inviting them up to the event! Laura Nichols and Holly Howell add to David Wren's great piece about the history of Woofstock and what it's grown into that he did for the Ithaca Journal. Plus, they add in a pic of Max & Rubie, our original 4-legged ambassadors and hosts. The folks at the Cayuga Radio Group have always helped support us with this event, and this year is no exception! The week before the event, Joe did interviews with the different hosts on the different stations, promoting the benefit! 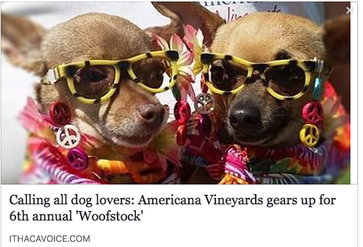 Amanda R. Livingston came to Woofstock on June 2, tried some wine, pet some puppos and wrote a great piece about what she saw and experienced at the event!